Riot police officers detain protesters during a rally in St.Petersburg, Russia, Oct. 7, 2017. Supporters of opposition leader Alexei Navalny rallied across Russia on Saturday, heeding his call to pressure authorities into letting him enter the presidential race with a wave of demonstrations on President Vladimir Putin's 65th birthday. Supporters of Russian opposition leader Aleksei Navalny staged nationwide protests on Saturday to coincide with Russian President Vladimir Putin’s 65th birthday, with police making scores of arrests. Rallies and pickets were held in dozens of Russian cities, including Moscow, Vladivostok, Khabarovsk, Ulan-Ude, Chita and Stavropol, with protesters demanding that Navalny be allowed to participate in the country’s March 2018 presidential election. The Moscow-based OVD-Info, a group that monitors politically motivated arrests, said there had been at least 271 people arrested at protests in 26 cities as of 9 p.m. 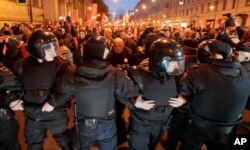 There was no harsh crackdown by police as seen in past rallies organized by Navalny. In March, police arrested more than 1,000 demonstrators in Moscow alone during nationwide protests. Most of the arrests on October 7 came in Putin’s hometown of St. Petersburg. Over 1,000 people gathered at Marsovo Polye (the Field of Mars) in the city center and then marched across the city, chanting "Russia without Putin!" and "Putin, retire!" OVD-Info said at least 62 people were detained in St. Petersburg, coming after some opposition protesters tried to break through police lines in the city’s main street. A large police presence had assembled throughout the city center before the rally. Earlier in St. Petersburg, Navalny’s campaign coordinator, Mikhail Sosin, and the campaign's lawyer, Denis Mikhailov, were detained. His campaign coordinators in Perm, Tver and Stavropol were also detained, as well as numerous campaign activists across the country. Supporters were demanding that Navalny be allowed to participate in the country’s March 2018 presidential election. In Moscow, several hundred people gathered at central Pushkin Square, where protesters had planned to march to the Kremlin but were blocked by police, prompting them to turn back. The protesters included teenagers holding rubber ducks, a symbol of opposition to the government, after reports that Russian Prime Minister Dmitry Medvedev had a special house for a duck in one of his properties. Protesters at Pushkin Square chanted "Putin is a thief!" "Happy Birthday!" "We are the authorities!" "Russia without Putin!" and "Free Aleksei Navalny!" Heavy rains had hit Moscow, and many demonstrators were drenched. Police in Moscow had asked people over loudspeakers to disperse. There were at least 10 police vehicles in the square, although law enforcement officers were unprecedentedly restrained. Riot police officers block the way to protesters during a rally in St. Petersburg, Russia, Oct. 7, 2017. Anton, 20, was holding a "happy birthday" balloon and a wrapped gift box with "pension" written on it. He said he wanted the entire Russian leadership to retire. "I think you can change the country through street [protests], but if not, at least it's good fun." Nikita Grigoryev, 16, a Moscow schoolboy holding a rubber duck, told RFE/RL: "I'm here to demand the authorities let Aleksei Navalny campaign [for president]." "I doubt [this protest] will make any difference, but we have to show there are many people unhappy with what's going on in the country," he added. Lyudmila Gurova, 57, a pensioner, told RFE/RL: "We need freedom: freedom of assembly, freedom of identity, freedom to express our views about the country. This is a fascist country, I believe fascism has taken hold. For the last 26 years I have lived in social hell." The protests came a day after a Moscow court rejected Navalny's appeal against a 20-day jail term he was handed after being found in violation of the law for publicly calling for unsanctioned rallies. The ruling meant that Navalny remained in jail during the protests. Navalny’s election campaign chief, Leonid Volkov, was also sentenced to 20 days in jail on Thursday. The local governments of numerous cities have not granted permission for the planned demonstrations. Another wing of the liberal opposition, the Yabloko party, criticized Navalny for organizing the unsanctioned rally and for calling on his supporters to enter "deliberate confrontation with the police, under the batons of the OMON riot police." "Such 'events' are frankly provocations aimed only at dubiously creating PR for a certain person," the party said in a statement on its website. Ahead of the protests, Russian authorities issued warnings against holding demonstrations without official permission. Putin's spokesman, Dmitry Peskov, told reporters on October 3 that "public calls for unsanctioned rallies and meetings are illegal ... and therefore organizers of such events will be prosecuted." Prosecutors in St. Petersburg said on October 6 that "any attempts to conduct unsanctioned [demonstrations] are a direct violation of the law." Russian opposition leader Alexei Navalny talks to journalists after he was sentenced by a court to 20 days in jail on charges of repeatedly violating laws governing the organization of public meetings and rallies, during a hearing in Moscow, Russia, Oct.
Navalny had urged Russians to join the demonstrations, being organized in more than 70 cities nationwide, to support "political competition" in the country as he seeks to run in the upcoming presidential election. "I understand perfectly well that that [the Kremlin] needs me to be locked up as much as possible and particularly on October 7," Navalny's spokeswoman, Kira Yarmysh, quoted him as saying in court. Navalny's campaign team called on all "decent people" to participate in the demonstrations. "Our demands are reasonable, simple and lawful: political competition [and] access to presidential elections for Navalny and other candidates," it said in an statement on Friday. It added that authorities should "leave activists, volunteers, monitors and others alone and give them the opportunity to freely participate in election campaigns." Navalny is a fierce critic of Putin, who has held power as prime minister or president since 1999 and is expected to seek a new six-year term in the March election. Putin is virtually assured of victory as the tightly controlled political system leaves little room for surprises. A 41-year-old lawyer who has produced numerous reports alleging corruption among key Putin allies, Navalny has opened more than 60 campaign offices and held rallies nationwide since announcing his bid for the Kremlin in December. Russia's Central Election Commission, however, said in June that Navalny was ineligible to run for public office because of a financial-crimes conviction in one of two high-profile cases that he says were fabricated by authorities for political reasons. Two previous nationwide demonstrations spearheaded by Navalny earlier this year led to mass detentions and rattled Russian officials with their substantial youth turnout. The New York-based Human Rights Watch, meanwhile, said last month that Russian police were "systematically" interfering with Navalny's attempts to run for president by raiding his campaign offices, "arbitrarily" detaining campaign volunteers and carrying out "other actions that unjustifiably interfere with campaigning." The Kremlin has dismissed Navalny, who finished second in Moscow's 2013 mayoral election with around 27 percent of the vote, as a convict and a marginal political figure. With reporting by RFE/RL's Russian service, Current Time TV, Ekho Mosvky, Fontanka and RIA-Novosti.